How Many Calories Are There in Chaas (Buttermilk) & Does It Have Any Health Benefits? Buttermilk or chaas is an Indian traditional everyday drink made from curd, water, spices such as cumin, curry leaves, black pepper, ginger, coriander leaves, green chili and salt. Grind black pepper, cumin, curry leaves, coriander leaves, and a ginger piece. Take curd in a bowl and blend it in to a thick paste. Add water to it and mix it well to form a homogeneous solution. Put some green chilies and salt in the solution. Stir well and serve cold. Buttermilk is packed with numerous health benefits. Buttermilk is a rich source of calcium which helps to slow down bone loss as you age. It also helps to evade off osteoporosis and osteoarthritis. Buttermilk contains riboflavin which activates enzymes in your cells and helps drive energy production. Riboflavin supports liver function and improves detoxification of your body. Buttermilk enhances your protein intake which is important for maintaining strong bones, muscles and flawless skin. It is an ideal drink to soothe the irritated stomach after consuming a spicy meal. Buttermilk effectively cleanses the fat, ghee or oil that gets accumulated in the inner walls of the food pipe and stomach. The carminative action of ginger, pepper and other spices curb belching and digestive ailments. Buttermilk is packed with numerous electrolytes and water. Hence, it is a perfect drink to fight dehydration during summer. For those suffering from Lactose intolerance, Buttermilk provides them calcium without causing an adverse reaction. 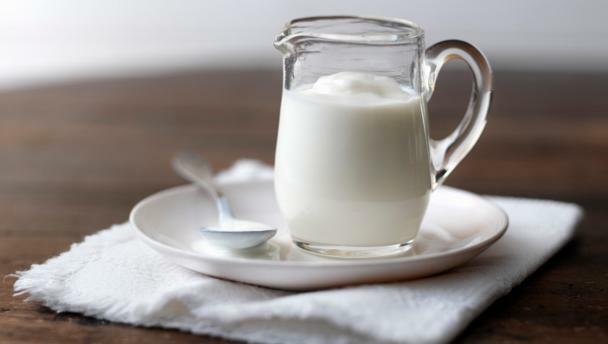 The presence of a bioactive protein known as MFGM or milk fat globule membrane in Buttermilk possesses antiviral, anticancer and antibacterial, properties. Previous article How Many Calories Are There in Jal Jeera & Does It Have Any Health Benefits? Next articleHow Many Calories Are There in Kokam Sharbat & Does It Have Any Health Benefits?